For the Colts, training camp means holing up at Anderson University, staying in the dorms, and concentrating on the season. They eat there, they sleep there, and most importantly, they practice. Any students and staff at Anderson have been told not to approach the players, because they need to focus, they’re there to work. Expectations are high this year as the Colts are being favorite to go to the Super Bowl. At Tuesday’s practice the Colts looked good. For the three hours in afternoon practice, the Colts worked on drills and full team practice that included pads and hard tackling for the first time. Defense and offensive drills took on a new intensity with the added protection. Andrew Luck looked good. He has yet to throw an interception. 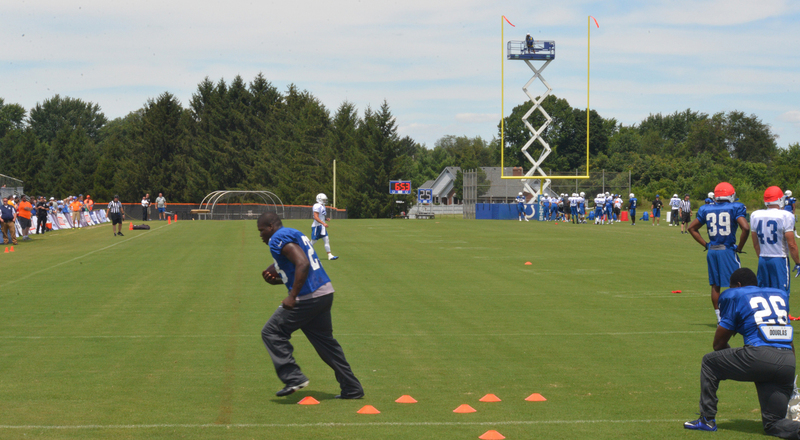 Frank Gore looked made a couple deep run plays during Tuesday’s practice. He along with veteran wide receiver Andre Johnson are new additions to the Colts this season. Though they’re older players, they are fitting in well with the Colts. 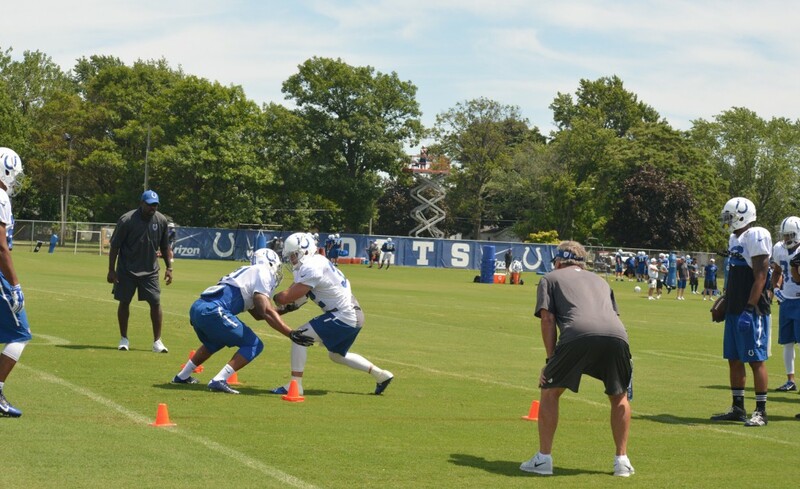 Coby Fleener and Boom Herron also stood out at practice, making deep run plays, as did T.Y. Hilton. Hilton. Needless to say, the offense for the season is ready and set. Colts only have a few more cuts to make before they are ready to start the season. And what a promising season it looks to be. Coach Pagano addressed some defensive issues. As, the starting offense line looks more set as the same group stacked up again on the fourth day of training camp. The line looked like this: RT Jack Mewhort, RG Todd Herremans, C Khaled Holmes and LG Lance Louis. Although with different smaller groups rotating out with quarterbacks. Training Camp will lead right up to the preseason games starting on September 16th. You’re going to want to start game day with the VIP Tailgate Party because this is the season to celebrate in style! And don’t forget to get your Colts tickets so you can see them play live.